The cover price is US$90.00. This book contains over 450 viewgraphs. This is part of the Pyrotechnic Reference Series. 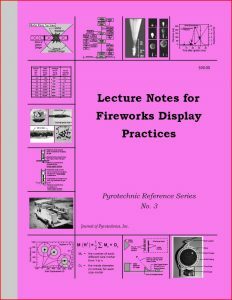 The Lecture Notes for Fireworks Display Practices [ISBN-978-889526-17-1] is a set of class notes from a week-long course on practical and safety aspects of performing fireworks displays. Each 8½ x 11″ page contains a pair of photocopy-reduced viewgraphs from the course lectures. The over 450 viewgraphs include 350 photographs, 120 drawings, and 50 data tables. Each viewgraph of text is intended to be complete enough for the reader to be able to understand the subject being discussed. 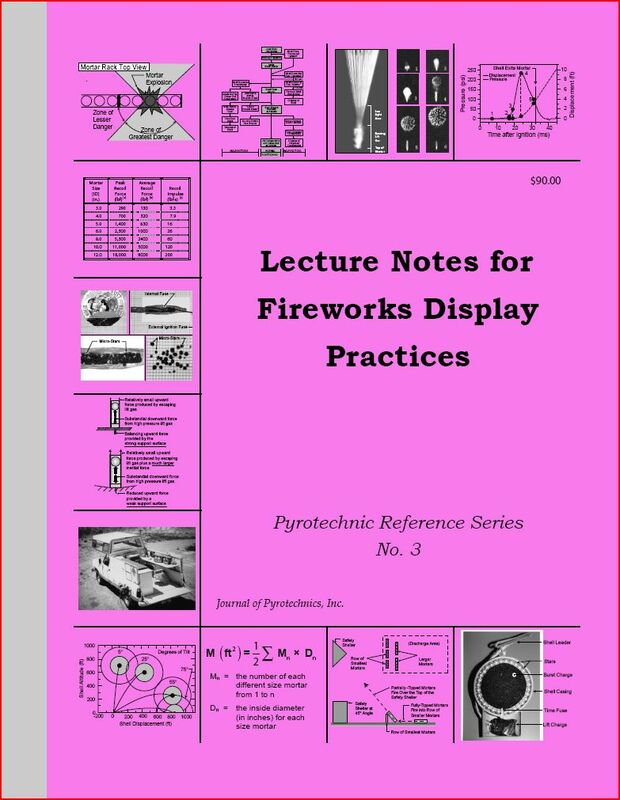 Topics covered include: hazard management; fireworks construction, operation, and characteristics; fireworks display safety; display equipment; manual display set-up; making repairs to fireworks; manual display firing; electrical display firing; and transportation and storage. Although greatly expanded, the cover price remains the same at US$90.00. See Order Form for discounts and shipping. A review of this book by Tom Handle, currently an officer in the PGI, has been printed in American Fireworks News, No. 295, April, 2006. Below is the complete outline of subjects covered in the notes. The cover price is $90. See Order Form for pricing and shipping.